WhatsApp is a cross-platform social networking app which allows users to send instant messages, share images, audios and more. Sometimes, due to some reasons, like accidentally deleted some messages on WhatsApp, you may need to preview and extract WhatsApp messages from iPhone backup. We are happy to help you here. This article will show you how to preview and extract WhatsApp messages in iPhone backup easily using a 3rd-party iPhone data Exporter tool- iRefone. iRefone supports to extract 16+ file types, such as photos, text messages, contacts, notes, whatsapp, wechat, etc. It enables to extract data from iOS device, iTunes backup and iCloud backup. 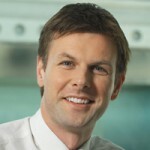 It allows you to preview data in the software so that you can selectively to extract the data you want. 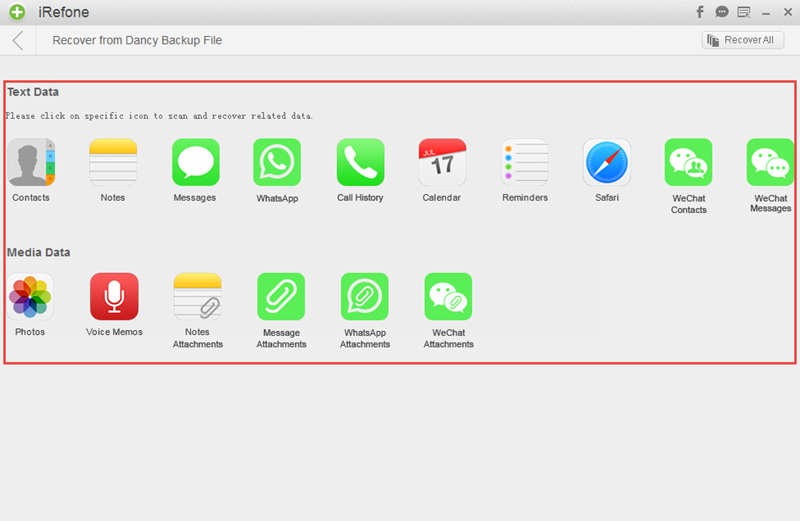 Below we will show you how to extract WhatsApp messages from iPhone backup. Step 1: Launch iRefone and choose “Recover from iTunes Backup” as the recovery mode. All of the iTunes backup files which you have ever synced with iTunes on this computer will be automatically found and listed in the software. Click “Select” or double click the backup you need to access the data interface. Step 2: Choose WhatsApp you want to scan and recover. Click the icon to start the scanning. Step 3: When the scanning is finished, preview whatsapp messages in your iTunes backup and pick out these messages you need to save on your computer. Click “Recover to PC” to choose the store folder. 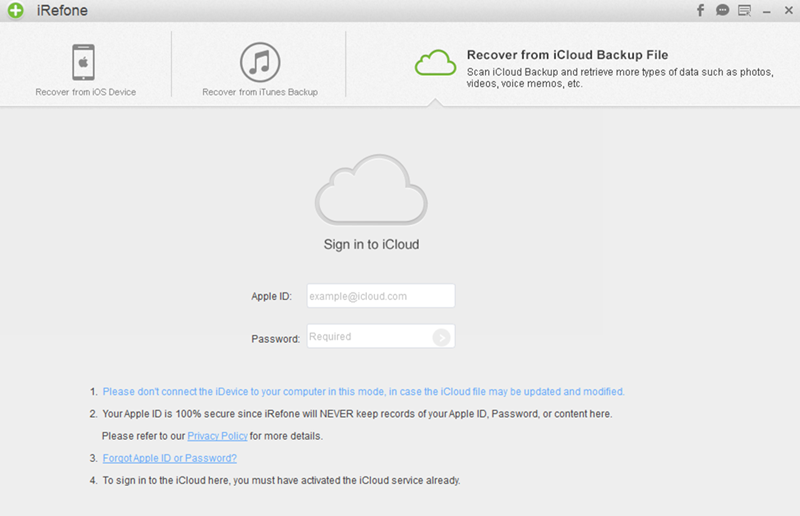 Step 1: Choose “Recover from iCloud Backup” to recover data. Sign in your iCloud account with Apple ID and passcode. 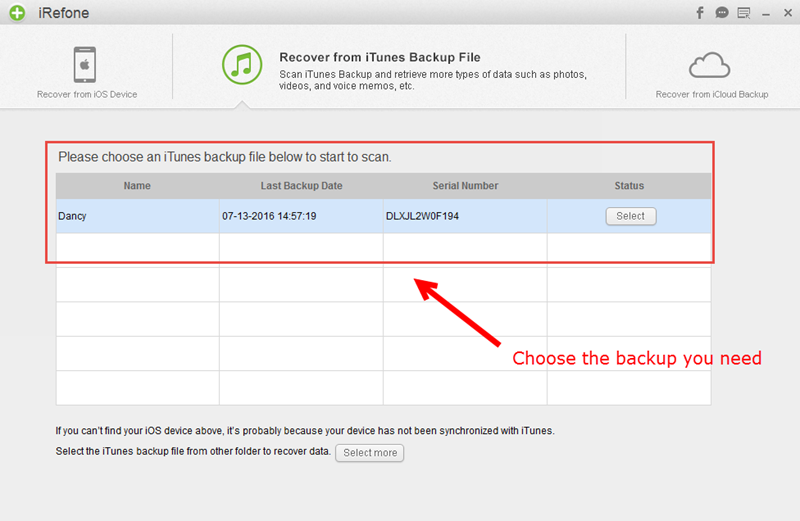 Step 2: Choose the data you want to recover in your iCloud. This process will reduce the time of downloading. The less data you choose, the less time wait for the downloading. 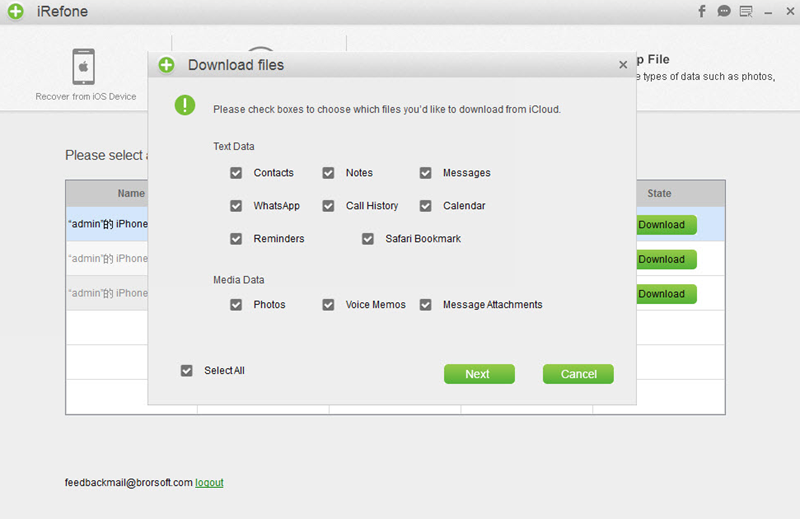 Step 3: When the downloading process is stopped, you can click the icon of WhatsApp you need in your iCloud backup file. Step 4: You could preview all of whatsapp messages in iCloud backup. Select these chat history you need to recover them on your computer.